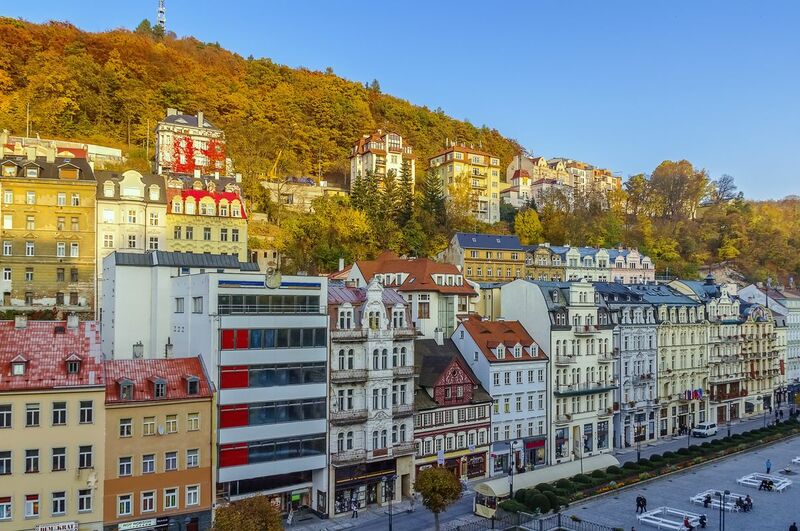 Founded in 1370, Karlovy Vary is famous for its hot springs, making it a notable spa city. Beautiful mansions from the Belle Epoque era sit near the River Teplá. The city also served as the site for popular films like Casino Royale, a nod to its popularity with international celebrities. An amazing small spa town with fountains and springs as well as great architecture. There are some interesting shops, expensive jewellers and a plethora of cafes and restaurants. Behind the town is a large hill which can either be climbed on foot or accessed via funicular railway. It is quite steep so I suggest ascending on the funicular and then walking down. Make sure to purchase a drinking cup for the fountains at one of the many kiosks as this is the best way to drink from the springs and makes a brilliant souvenir. However, many restaurants are not so good. You have to pay 15 - 20 euros for a decent meal. The buildings are so colorful and fairytale-ish. The overall atmosphere is a relaxing one, like time has stopped for a break. Czech Republic is one of my favorite places in the world and Karlovy Vary is my favorite place in the Czech Republic. I went there several years ago as a teenager traveling with my school choir and the town made such an impression on me. I was in awe of this special place, a town built on hot springs, the people walking around sipping from mugs made especially to optimize the healing effects of the natural springs. We had an opportunity to perform in the town square when I was there, it was magical to say the least. Before leaving I was able to purchase one of the special mugs, a pink one, that I still have. This town is definitely worth visiting, I hope to go back and see it again someday. The spa resort town of Karlovy Vary (Karlsbad) in western Bohemia was the actual film location for "Montenegro" in James Bond's "Casino Royale." This charming medieval town, a popular tourist destination since the 19th century, is an easy and highly recommended day trip from Prague. We planned a whole day at Karlovy Vary - and it was more of a half day excursion. It's nice and quaint - but can be walked from end to end in a couple of hours. The big thing is what the Czechs believe is the mineral-rich water that has healing properties - so everyone is sucking on these strange morphs between a pitcher and a cup - and they're sold everywhere. Other than that - like Prague, Karlovy Vary is beautiful and well-kept. Was short and sweet. Beautiful little city nestled in a valley near the German border. And don't miss the Krusovice brewery restaurant on the way from Prague. Karlovy Vary is an easy day trip from Prague. This town sits in the foothills of the Czech countryside and is beautiful. Plenty of restaurants and areas to hike and get in some good walks to check out the sights. The mineral water is a draw, and it's supposed to have some sort of healing powers. I took a sip and am still here, so maybe there is something to it.